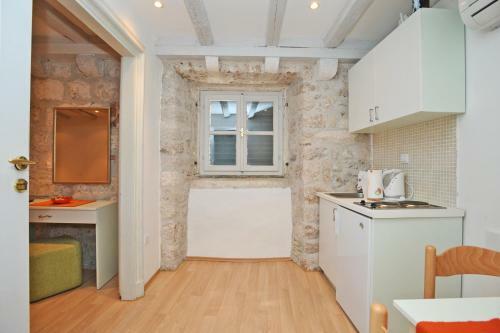 Situated in the very center of the UNESCO-listed Dubrovnik’s Old City, Studio Čikato is just 100 metres from the acclaimed Stradun Promenade. It is embellished with stone wall elements and modern furnishings. 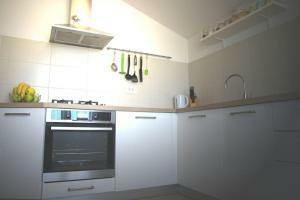 The studio is air conditioned and presents views of the market. 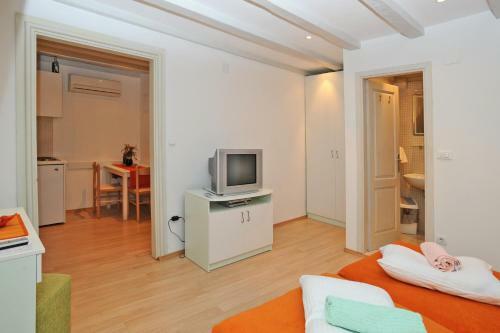 It comprises satellite tv and a kitchenette with dining area and toilet. Free internet access is provided. The closest grocery store is 50 metres away. 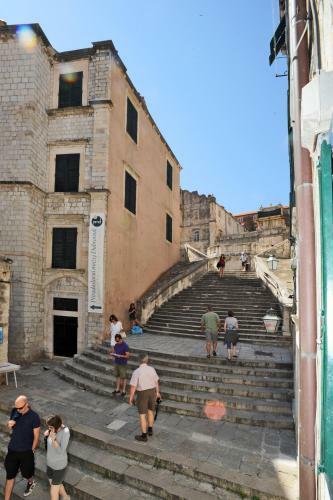 Visitors can conveniently explore Dubrovnik’s attractions, for instance Onofrio's Fountain and St. Vlaho Church or enjoy clubs and eating places serving local cuisine. Excursions to local islands can be arranged with taxi boats in the old harbour, a 2-minute walk away. Funicular coming to Srđ Mountain is 500 metres from the Studio Čikato. The nearest beach is just a couple of minutes walk away. The Main Bus Station and Dubrovnik Ferry Port can be reached within 3 km. Dubrovnik Flight terminal is at a distance of 20 km. 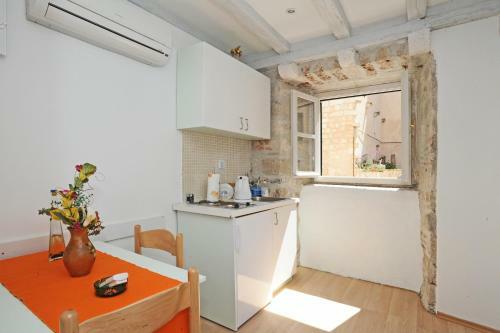 La Piazza apartment ~0.1 km, Dubrovnik price per day from € 102 The sizable, air-cooled La Piazza Apartment is set right in the Old City of Dubrovnik, only 100 metres from the basilica and the Stradun main street. 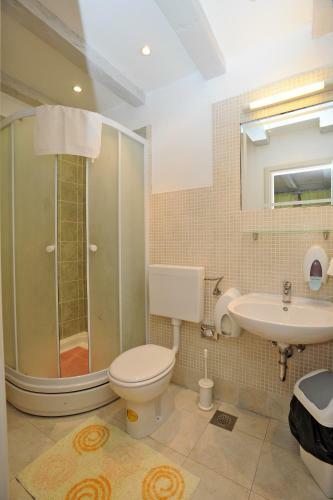 The apartment presents a sleeping room, a living room with a lcd tv and a DVD player, a kitchen, and a toilet with a bath. Dubrovnik Flight terminal is located 15 kilometers away. 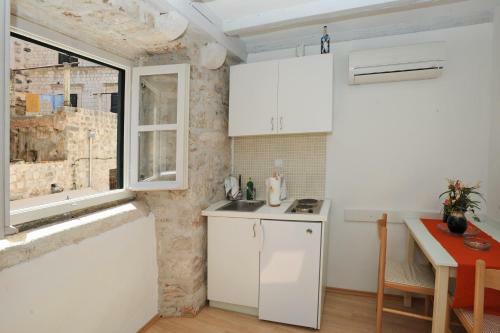 Studio Čikato ~0.1 km, Dubrovnik price per day from € 85 Situated in the very center of the UNESCO-listed Dubrovnik’s Old City, Studio Čikato is just 100 metres from the acclaimed Stradun Promenade. It is embellished with stone wall elements and modern furnishings. 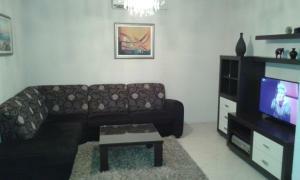 The studio is air conditioned and presents views of the market. 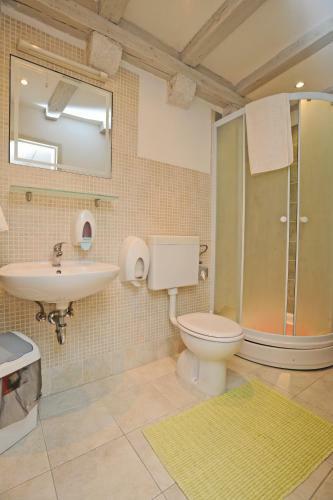 It comprises satellite tv and a kitchenette with dining area and toilet. Free internet access is provided. The closest grocery store is 50 metres away. 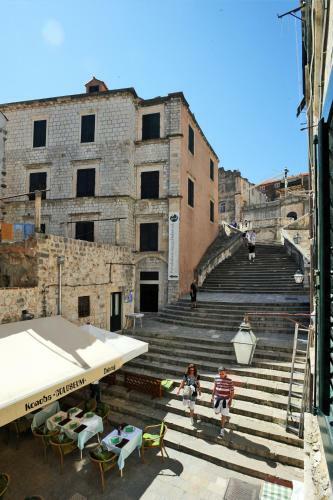 Visitors can conveniently explore Dubrovnik’s attractions, for instance Onofrio's Fountain and St. Vlaho Church or enjoy clubs and eating places serving local cuisine. Excursions to local islands can be arranged with taxi boats in the old harbour, a 2-minute walk away. Lapad ( ~ 3.3 km ): 656+ apartments. Zaton Dubrovnik ( ~ 8.1 km ): 194+ apartments. Kolocep ( ~ 9.1 km ): 17+ accommodation units. Beach Buza, Dubrovnik ~ 0,2 km from Studio Čikato Rocky beach: recommended for young people, with caffe bar. Beach Penatur ~ 0,5 km from Studio Čikato Rocky beach: with caffe bar. Beach Banje, Dubrovnik ~ 0,6 km from Studio Čikato Gravel beach: recommended for young people, with restaurant, with caffe bar, equipped with showers. Excellent choice of watersports. Beach Dance, Dubrovnik ~ 0,7 km from Studio Čikato Rocky beach: with restaurant, with caffe bar, equipped with showers. Beach Sv. 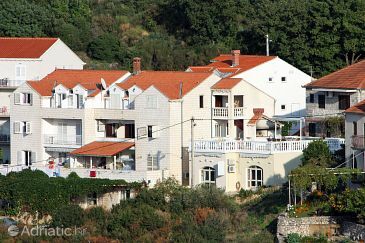 Jakov, Dubrovnik ~ 1 km from Studio Čikato Gravel beach: recommended for young people, with restaurant, with caffe bar, equipped with showers. Excellent choice of watersports. Restaurant Konoba Ekvinocijo, Dubrovnik Guest reviews: 8,2/10 ~ 0,1 km from Studio Čikato Address: Ilije Sarake 10, Dubrovnik. Cuisine: Croatian cuisine. Restaurant Azur Dubrovnik, Dubrovnik Guest reviews: 9,2/10 ~ 0,1 km from Studio Čikato Address: Pobijana 10, 20000, Dubrovnik. Cuisine: Mediterranean cuisine, Fusion, Asian cuisine fusion. Restaurant Konoba Jezuite, Dubrovnik Guest reviews: 8,5/10 ~ 0,1 km from Studio Čikato Address: Poljana Rudjera Boskovica 5, Dubrovnik. Prices: 56 HRK - 140 HRK. Cuisine: Mediterranean cuisine, Croatian cuisine. Restaurant Cafe Bar Bard, Dubrovnik Guest reviews: 10/10 ~ 0,1 km from Studio Čikato Address: Kneza Hrvasa 11, Dubrovnik. Cuisine: Contemporary, Bar. Restaurant Kopun, Dubrovnik Guest reviews: 9/10 ~ 0,1 km from Studio Čikato Address: Poljana Rudera Boskovica 7, 20000, Dubrovnik. Cuisine: Croatian cuisine.